Castles are distinguished, majestic structures that were built to intimidate and fortify, or to prove one’s wealth and status. Now, hundreds of years later, the ones that remain continue to surprise and excite guests. 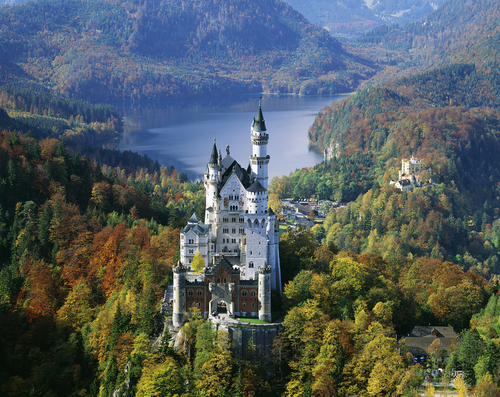 On your next international vacation, check out these fabulous castles around the world! Spectacular views, incredible architecture, fantastic history – everything you want from a Welsh castle! We’ve heard that a Welsh castle is a must-include on any castle list, so we made ours number one. 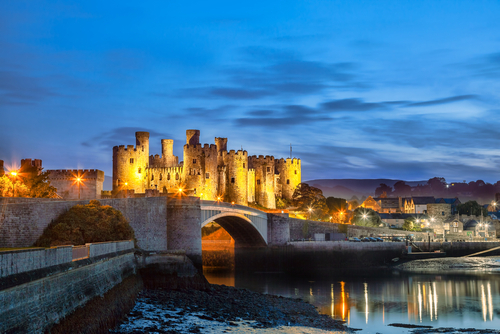 Conwy Castle in the aptly named Snowdonia is the epitome of a medieval structure and is one of the best preserved buildings. Built from 1227 to 1307, this massive building boasts eight towers and a bow-shaped great hall that is still perfect for entertaining and is used for theatre productions and other events. The intact hall, kitchen, private chambers, and royal chapel provide a peek into the world of royalty and medieval opulence, while the nearby Snowdonia National Park offers spectacular views of mountain peaks, dramatic waterfalls, and lavish valleys. “Let them eat cake!” Or let them stay in a famous castle, like Versailles! Perhaps no palace or castle is as quirky as Versailles, a UNESCO World Heritage Site that was built for no other reason than to display opulence and ego. The palace, with its famed Hall of Mirrors and the King’s Grand Apartments, now houses the Museum of the History of France, and the gardens of Versailles are quite famous themselves. The horticulture took more than 40 years to complete. Also on the grounds of Versailles are The Grand Trianon, which housed Louis XIV and his extended family, Napoleon Bonaparte and his second wife, and even presidents of France; and Marie-Antoinette’s residence, which was the queen’s private residence away from the pageantry of the court. Glamis Castle may have been the childhood hold of Her Majesty Queen Elizabeth, The Queen Mother, but it has secret rooms and a sordid past! While this castle exhibits all the charm and beauty of a medieval home, Glamis Castle is best known for its hair-raising, uninvited guests. As one of the most haunted castles in Britain, the 600-year-old structure has recorded its fair share of sordid past legends, including a morbidly disfigured child and royal enemies who might have found their unsightly ends in a secret room. 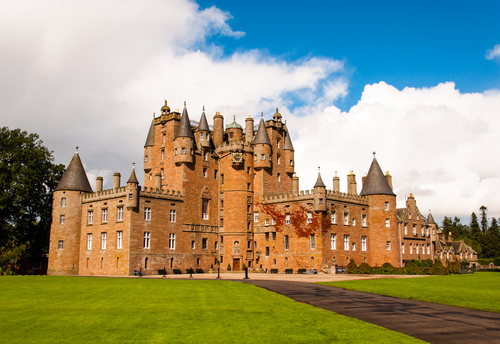 Glamis is also famously known as the childhood home of Her Majesty Queen Elizabeth, The Queen Mother and as the setting of Shakespeare’s Macbeth. Today, guests can explore the exhibition rooms, the spectacular gardens, and natural sights before enjoying a lovely afternoon cup of tea. Come for the falcons but stay for the haunted dungeon at Hohenwerfen Castle! Bats in the belfry? Only falcons are in this one. 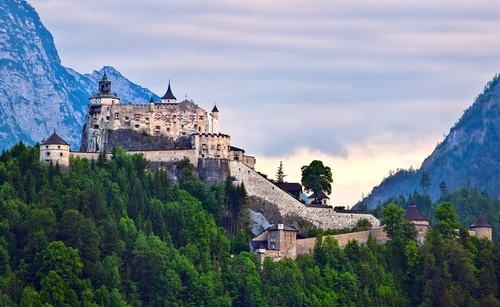 Hohenwerfen Castle is home to the first Austrian Falconry Museum and showcases incredible feats of flight by eagles, owls, vultures, and of course, falcons, all at the command of medieval-ly dressed trainers. The iron maiden and thumb screws make this dungeon one of the most chilling in Europe. Special night guided adventures are available for those seeking a surge of adrenaline. Nestled between the awesome Tennen and the Hagen Mountain Ranges, “Burg Hohenwerfen” rules over the Salzach Valley and National Park Hohe Tauern, which is the largest natural reserve in the Alps. 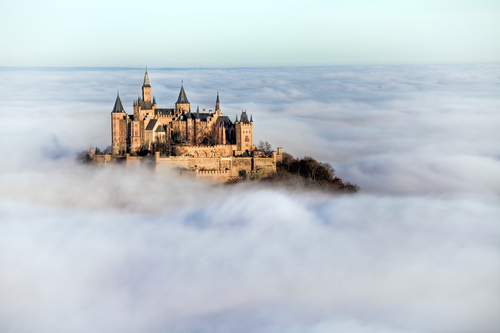 Hohenzollern Castle survived the Thirty Years’ War, and now it’s the perfect summer getaway! Third times the charm for this magnificent structure. Hohenzollern Castle was built on the site of the first and second royal castles of Prussia, the latter which endured the Thirty Years’ War among other conflicts before falling into disrepair. The royal family reconstructed it in the 19th century to much acclaim, and now, the castle is a major tourist attraction with its neo-gothic charm and elegant galleries. On the top of a mountain in Swabia, it is particularly popular in the winter months with its majestic structure contrasting breathtakingly against the immaculate snow. During the summer, the castle hosts concerts and open-air cinema. Sure, Neuschwanstein Castle is an incomplete masterpiece, but you really just care that it was the inspiration for Sleeping Beauty Castle in Disneyland. Our Tour du Castles stays in Germany, where 1.4 million guests visit the home of King Ludwig II, “The Fairy-Tale King,” who had the castle built so he could withdrawal from public life. Much of the structure’s décor was inspired by the works of Richard Wagner, a German composer whom the king admired. Neuschwanstein Castle boasts a two-story throne room but no throne, as it was not completed by the time of Ludwig’s untimely demise. The unfinished castle is still magnificent with romantic paintings, grand chandeliers, and a bedroom carved from wood. The majestic castle served as one of the inspirations for Sleeping Beauty Castle in Disneyland. 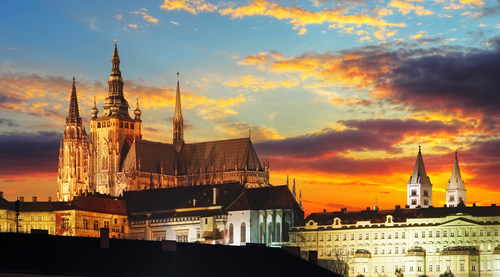 Prague Castle is large and in charge since it’s the biggest ancient castle complex in the world. One of the most beloved sites in the Czech Republic, Prague Castle is the largest ancient castle complex in the world with an area of almost 230,000 square feet. (That cousin you didn’t like is coming to dinner? No worries. You’ll never see him.) Since it was built over time, the castle’s buildings range in design from 10th century Roman style to 14th century Gothic motif and include exquisite churches, lavish gardens, royal chambers. The castle now acts as the government complex, housing the offices of the president. Like England’s Buckingham Palace, there is the changing of the guard ceremony that is not to be missed. Mystery, romance, and political intrigue consume the legends of this incredible landmark. 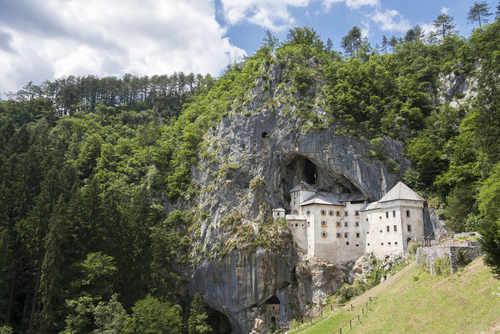 Built over a 403-foot cliff, Predjama Castle is one of Slovenia’s most treasured and adventurous sights with its Late Gothic décor, its remarkable treasure, and its unique placement. The structure is built into a cave, where its most famous inhabitant, Knight Erazem, supposedly received supplies through a secret passage during sieges. (He reportedly met his demise in the latrine.) The castle meets the necessary medieval criteria with a drawbridge, a dungeon, and murder holes. From May through September, the Postojna Cave offers a double-tracked train ride with dramatic views of limestone archways. 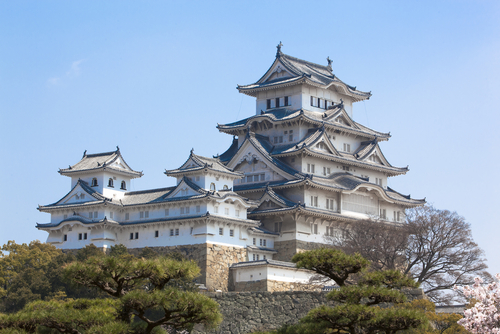 Himeji Castle has a rich history including samurais! Another UNESCO World Heritage Site, Himeji Castle is the finest surviving early 17th-century Japanese castle. The fantastic structure is 82 releases, made of aesthetically-pleasing wood and white-painted plaster, and is situated on a hill overlooking the Harima Plain. The central “donjon” rises six stories with three shorter towers helping to enclose the fortified courtyard. Regular repairs were done through the 19th century and only reinforcements have been done recently, keeping the integrity of the castle, the gates, the ramparts, and the stone walls intact. While some samurai living quarters and the west bailey were demolished for military buildings, they were removed in 1945 to keep the castle’s foundations pure. 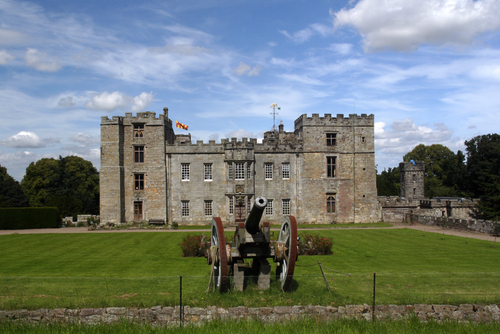 Chillingham Castle has an apt name since its history of blood, violence, and ghost is quite chilling! Perhaps one of the most haunted places in the world, Chillingham Castle has been home to several ghosts, including a White Pantry Ghost, the famous Blue Boy, and ghosts in the courtyard. Though “The Blue Boy” or “Radiant Boy”, recognizable by a blue halo in the Pink Room, was believed to be removed in the early 20th century when the bones of a young boy were found in a wall, there are still two voices that mumble in the castle’s chapel and numerous ghosts who occupy the dungeon.